All certified pets must wear proper PAWS of CNY identification at all organized visits and events. When your pet has passed his/her PAWS of CNY Therapy Pet evaluation test and on-site evaluation, you will receive a confirmation certificate in the mail, along with a PAWS of CNY bandanna to wear to visits and events. In addition, you may choose to order a PAWS of CNY therapy dog vest. The cost for the vest is $36.60 (includes tax and shipping). 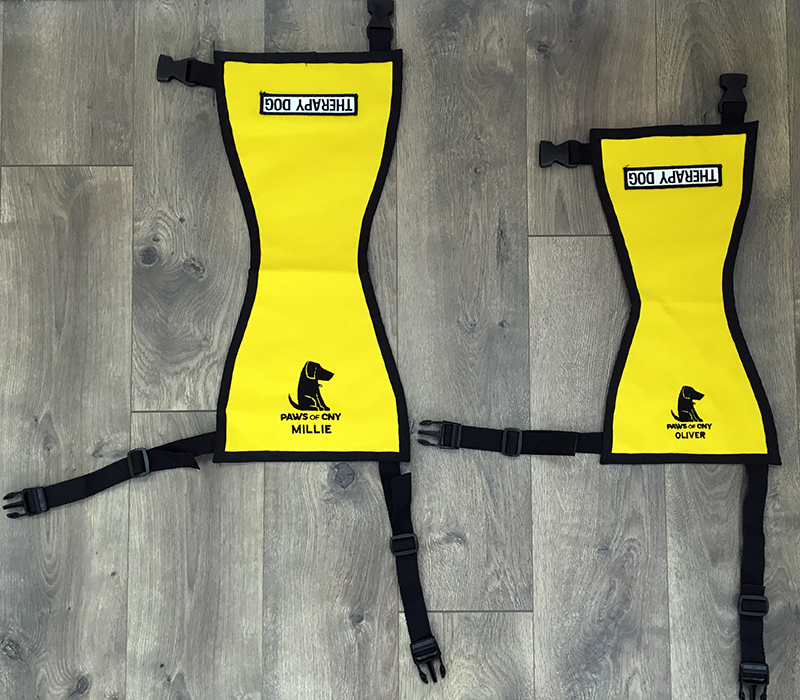 As an optional service, you may choose to have your dog’s name embroidered onto the vest at no additional cost. Vets are ordered based on the dog or cat’s weight and are shipped directly from the manufacturer. Please allow 4 – 6 weeks for the vest to arrive. If your pet has also passed the Canine Good Citizen (CGC) evaluation, you may order a Canine Good Citizen patch directly from the American Kennel Club here and have it sewn on the vest above the “Therapy Dog” patch.